Here's How To Get Started With Real Time Gaming's Bonus Poker! Real Time Gaming are one of the leaders when it comes to developing gaming software. 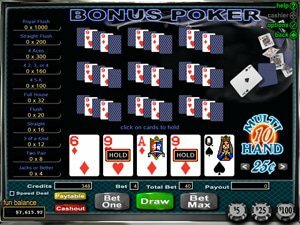 With their video Bonus Poker game, it looks like they've created yet another great fun online game for the Poker fan to play. To get started playing RTG's Bonus Poker game, the player firstly clicks on the 'Bet One' Button or the 'Bet Max' Button. The maximum coins a player can use are 5 so if he clicks the 'Bet Max' option, Where it says Play 1 To 5 Coins in the Pay table above the five cards, the '5' column representing the maximum coin payout will be highlighted in blue. If the player decides to click the 'Bet One' button, he can increase his stake by one coin by repeatedly clicking it up to another four times. Again, the Payout table column will highlight in blue the amount of coins that he wishes to use for the game. Moving to the 'Deal/Draw' Button once selected the five cards will be dealt. It is now down to the player to decide if after studying the Pay table, there are any cards that he wishes to hold. If there are he simply clicks on them to hold them and now clicks what is now the red 'Draw' Button which will remove the remaining cards and replace them with fresh ones to make up his hand. The Pay table above the cards in Bonus Poker displays 11 different card combinations that a player can win, each pay differently to one another. They are Royal Flush, Straight Flush, Four Aces, Four cards the same numbered from 2-4, Four cards numbered the same from 5 to a King, a Full House, a Flush , a Straight, 3 of a Kind, 2 different pairs called 2 Pair, and lastly Jacks or Better. Try RTG's Bonus Poker today, this exciting game can be played for free, at the WinPalace Casino!